NXP’s S32 micro-controller has been selected by eight of 15 automakers for upcoming models. The AEC-Q100-qualified S32K family provides ISO CAN FD connectivity. The processors provide ten-times more performance than competing products based on public available statements, stated NXP. The scalable S32 family offers a unified architecture of micro-controllers (MCU) and microprocessors (MPU) with identical software environment across application platforms. The S32K series features CAN FD connectivity by means of one or multiple on-chip controllers. A common feature is the Asil-B support (automotive safety integrity level). Of course, other members of the family are suitable for Asil-D applications. "Traditional and disruptive automakers, even more than Tier-1s, seek a standardized way of working across vehicle domains, segments and regions to meet increasing performance demands while contemporarily ensuring fast time to market and control over skyrocketing development costs," said Luca DeAmbroggi, from IHS Markit. "A common architecture and a scalable approach can cut development time for critical applications in domains like ADAS, autonomous driving or connectivity from both the hardware and the software perspective." The ARM-based processors support Over-The-Air (OTA) updates with roll back options. The products also support NXP’s core security concept. "Our insight into the future of automotive caused us to re-evaluate the interrelationship between hardware and software," said Matt Johnson from NXP. "We saw that to build the software of tomorrow, the software behind future vehicles, we had to reinvent the hardware. We built our hardware to enable an identical software development environment across products and applications, thereby significantly reducing software development effort and shortening time to market. Our customers see it the same way." Leading OEMs are now using pre-silicon emulation and development tools available from third party partners. Further announcements from NXP partners related to these capabilities are expected soon. 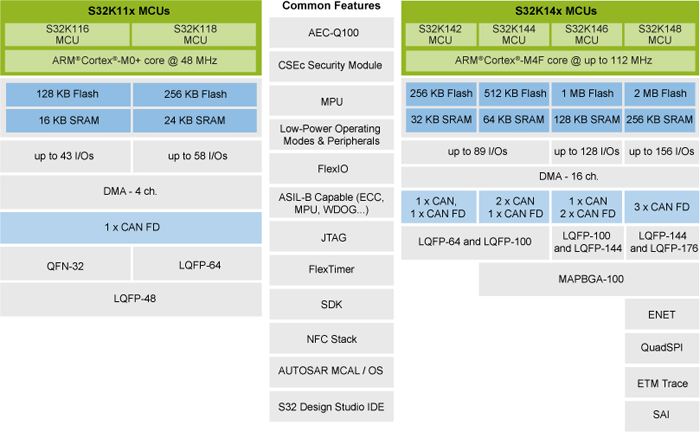 The S32K family includes members with CAN FD as well as Classical CAN only on-chip modules. The scalable products feature up to 2-MiB flash memory and up to 256-KiB static RAM. The smallest MCU has 43 I/O ports and the most powerful provides 156 I/O lines.